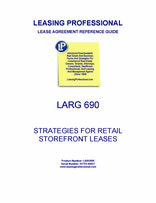 Reflections on the Retail Storefront Deal, and the Lease Clause Critique: A Pro-Tenant Retail Storefront Lease Sampler. This LARG looks at the retail storefront deal--the lease for the non-mall downtown urban location. The first section looks at the peculiarities of the storefront deal, especially when compared to its mall counterpart. The Lease Clause Critique contains a sampler of clauses (with comment) from an aggressively pro-tenant storefront deal. This is an age when most retail deals seem to be mall deals. They are familiar terrain for retail real estate professionals who may find themselves working simultaneously on four regional mall deals, three community center deals, and a couple of leases from specialty retail malls in downtown redevelopment projects. Everyone in retail real estate seems to know each other; everyone knows his lines. The parties to mall deals can assess their relative leverage quickly and accurately; they know the appropriate starting position for each lease issue, and they can usually predict how the compromise on each issue will be struck. Then, amid the calm, a crazy downtown storefront deal appears. It is the absolute perfect downtown location, but the landlord is Korean, or Iranian, or from the United Arab Emirates. You think you've seen the broker for the deal in in the new release of the movie Lawrence of Arabia. But, apart from the cast of characters, what makes the storefront deal so different from its mall cousin? A storefront deal is a lease for all or most of a freestanding building, usually in a top quality urban neighborhood. The term "freestanding" can be deceptive—often the sides (and in some cases the rear) of the building abut the structures sitting on adjoining properties. Notwithstanding the cozy proximity of properties, every building can and often does have a different owner. In many cases, the supply of desirable buildings in premier retailing locations (e.g., Beverly Hills, Union Square in San Francisco, Manhattan, the Near North Side of Chicago, the French Quarter in New Orleans) is scant. When a good location in such neighborhoods becomes available, the race goes to the swift, and the retailer that can make a decision and get the deal done in a hurry gets the storefront. Good storefront real estate is usually not attractive to the institutional investor as investment property. In many cases, storefront properties have a relatively small amount of square footage compared to other property alternatives. Often the buildings are not up to code, or have outdated HVAC and utility systems. For these and other reasons, the owner of good storefront retail property often turns out to be a foreign real estate investor, his family, or a partnership of foreign investors. Sometimes storefront landlords (especially those of foreign descent) greet prospective tenants and retail brokers with suspicion, and affect a high-handed demeanor to the outside world when discussing their properties. Are you familiar with the landlord's speech that runs: "I've got too many people ready to sign my lease as is and pay my asking rent right now. Dealing with you people is too much trouble. Take it or leave it." Then there is the lawyer for the eccentric owner. More often than not, attorneys look and act like their clients. This is true in the case of institutional owners who wear grey suits and grey neckties. It is also true in the case of the counsel for the eccentric owner. Put simply, crazy clients have crazy lawyers. Prospective tenants can not necessarily expect to negotiate for premier storefront space in a business as usual manner (i.e., with leisurely haggling over the business terms, and collegial, convivial point-counterpoint lease negotiations). Negotiations may be characterized by extreme and seemingly arbitrary positions on various business and legal issues. This is particularly true when the attorney for the foreign owner is in a general law practice (i.e., is not a real estate specialist). Such counsel are generally less familiar with the lease negotiating mating dance, and the customary horsetrades used to arrive at a commercially acceptable resolution of individual lease issues. This may compound the owner's paranoia that the fast talking tenant and the tenant's phalanx of brokers, advisors and attorneys are trying to put one over on the owner. Why Fool with Percentage Rent? There's a good chance that the storefront landlord will not care about percentage rent. It's the minimum rent that's foremost in their minds. Perhaps they view percentage rent as pie in the sky, something that they will never see anyway. Perhaps they fear that the tenant will manipulate reports of gross sales, and thereby cheat the landlord out of part of the percentage rent payable (probably not much of a risk when a national retailer is the tenant). More often than not, such landlords are interested in getting the minimum rent up as high as possible, and are willing to dispense with percentage rent altogether. In many cases, the storefront landlord's objective is to convert the property into an annuity, and notions of percentage rent which depend upon how the tenant does saleswise are simply incompatible with the concept of guaranteed returns. Exclusive use clauses, likewise, are unnecessary. Language pertaining to definitions of and exclusions to gross sales, and reporting requirements for gross sales are obviously of no use. If the storefront landlord's objective is a guaranteed rental stream from the property, the tenant's credit strength is of critical importance. If the tenant is a national retailer with chain store operations and solid credit, that can be the deciding factor in who gets the space, especially if all the prospects competing for the space are willing to pay the asking rent. For the same reason, kick-outs (i.e., convenience termination clauses giving the tenant the right to terminate the lease after a certain period of time if sales are not what the tenant anticipated) can be very sensitive issues in negotiations for premier storefront space. If the negotiating approach of the landlord is to bargain for a guaranteed minimum rental for a guaranteed period of years from a tenant with good credit, a tenant kick-out threatens to take that all away.